This article shows how to set up a non-standard RC input channel mapping using the RCMAP feature. This feature is available in AC3.2.1 and higher (and equivalent Plane and Rover versions). These can be changed by setting the RCMAP_ROLL, RCMAP_PITCH, RCMAP_THROTTLE and RCMAP_YAW parameters using the Mission Planner’s Config/Tuning | Full Parameter Tree (or Full Parameter List) as shown below. After changing any of these parameters the flight controller should be rebooted. 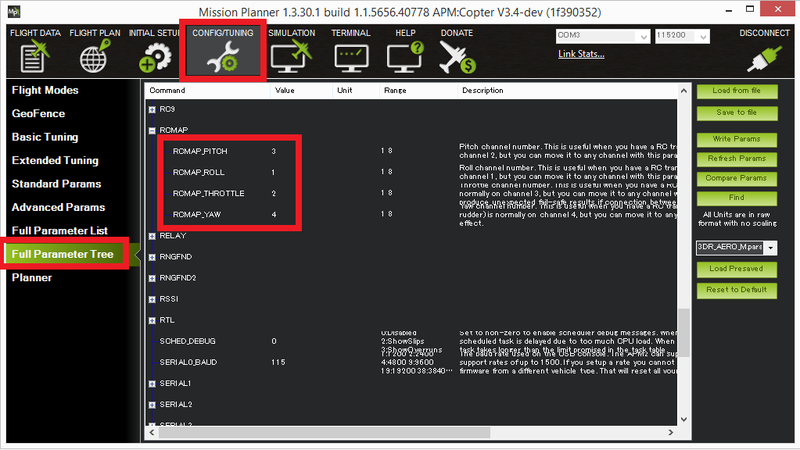 Additional information about the RCMAP parameters can be found for the respective platforms in: Copter Parameters, Plane Parameters and Rover Parameters. RCMAP_PITCH and RCMAP_YAW can be whatever channels you want to make them as long as they are not channels 1 and 2. For Rover you should also select the receiver channels that will be used to control the Waypoint select (LEARN_CH) and the Mode select (MODE_CH). As an example, the Gear switch (2-way) is on channel 5 and can be assigned to the LEARN_CH while the Flap switch (3-way) is on channel 6 and can be assigned to the MODE_CH.